At the time, I found it odd that our friend did not know how to do nothing. Looking back on it now, I think my jittery friend was just ahead of his time. It seems that every week I can add another person to my list of friends who proclaim, more proudly than sheepishly, that they “do not know how do nothing.” And between work-work and housework, kids’ homework, school events and sports, exercise, errands, volunteer commitments (no, that’s not an oxymoron), helping out aging parents and taking care of financial matters present and future, doing nothing is rarely a realistic option anyway. But what’s disturbing is that the more time you spend being extremely busy, the less comfortable you are when the music stops. The other day I got a text from a friend whose son was on my son’s travel baseball team until both boys left for camp. “You’re not going to believe where we are,” she wrote. “We’re at the game.” Of the travel team her son was no longer on, because he was away at camp. I think it was not only team loyalty that got my friend and her husband to drive across the county to watch other people’s 13-year-old sons play baseball. It was also the habit of being busy; they were so used to going to baseball games that they couldn’t stop cold turkey. They needed to transition, to wind down and remember what to do with their own time. My kids are the same way. They rarely have the opportunity to do nothing. If there isn’t something they have to do — homework, baseball practice, walking the dog — there are a million things beckoning to engage them: the computer, the television, the cellphone, the PlayStation, the I-touch. They are so constantly occupied, entertained, online and in touch with their friends that they are at loose ends when you pull the plug. Last week, as we were packing for six days at the beach, I shocked my sons by telling them they could not bring their laptops. They did complain from time to time about being bored. And they still had their phones, which meant more than a little “downtime” was devoted to texting. But they also sat with their boredom a little, and lived to tell the tale. They played catch. They practiced shooting targets with the airsoft guns they rarely can use at home because of what they deem our unfortunate proximity to small children. They read books. They walked around and through the marsh, and watched ospreys nesting on a pole. And they spent a good amount of time in the best do-nothing enabler of all: the hammock. There is something magical about a hammock. It’s not just how it rocks you like a cradle, but how it provides just enough semblance of doing something to do…nothing. What am I doing? I’m resting in the hammock. 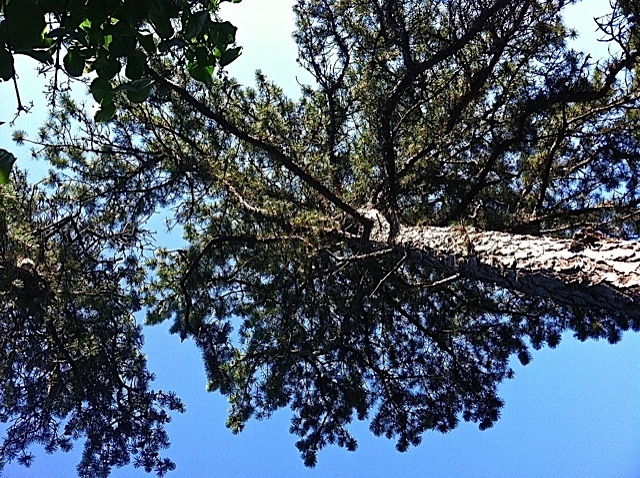 Looking up at the trees. Feeling the wind. Wondering if those little drips I feel are rain or if there is sap coming down from the pines. Pine sap? Does that even exist? How would it taste on pancakes? You get my point. You don’t let your mind wander because it leads to great thoughts. You let it wander because it needs to. You need it to, whether you know it or not. If you’re lucky, it wanders somewhere interesting. Four days into our vacation, my husband told me he knew he was relaxed because he woke up thinking about evolution. Four days for the imagination to assert itself against the pull of work, the email, the iPad, the to-do list. How often do we give ourselves four days? How often do your children get that? We all work so hard to help our children be good at things, but they are usually tangible things. Math and earth science, sports and music. There’s nothing wrong with that, but we should also make sure they know how to not accomplish anything. How to be at peace with themselves, in stillness or silence. They should know how to do nothing, and maybe even be proud of that. They should be good at hammocks. For a musical take on this theme, here’s an audio clip of a song called “Good” by John Gorka. To listen, just click here: 06 Good. What a fantastic post. Thanks Karen. Thank you as always! I love a hammock too. I think it can create a stillness that is not quite a stillness for boys too – something that they need. Somehow they need to keep moving in their quietness. Or even a trampoline to lie on, and look through it to the grass or look up to the sky. It seems to be hard to just be still – even my largest boy (hubby) of 42. When he is still, he falls asleep. So true, Meg. Something so unsettling for so many boys about having to sit still….my youngest used to not be able to watch TV unless he was standing on his head. Once upside down, he could be relatively still! God, Karen that was fantastic. Very profound and down to earth. And just comfortingly wonderful. It made me think back to last summer when I seemed to have endless house guest to entertain at the farm. And if I think about the best bit of the whole summer’s leisure time it was this: the one single hour I spent sitting in our hammock under the birch tree reading day old newspapers from England. Bliss. Lindy – your comment makes me wonder why a house only ever has at the most ONE hammock. Is it more special because we all fight for it? Or would it really be great if a house had three or four hammocks and guests could settle in and mellow out, too (of course most of us don’t have room for that, but I think you might)! I love this reminder to slow down and breathe — it’s not something I am particularly good at, and I’ve been struggling with it in my life and writing lately. We just came back from a lovely three week vacation in Maine, and it took days for me to slow down enough to watch the birds. Sit in the hammock. Exhale. Now we’re home and I’m trying to keep hold of that mentality, the value of being idle. Lisa – and isn’t it frustrating that while it takes days to wind down, it can take less than one day to tense up after a peaceful vacation? Sort of like how fast you can gain back the weight you took so long to lose. Not fair!